Thank you for your letter of the 25th. You have, I fear, returned to your habit of writing in riddles, which makes it extremely difficult for a person like me to follow you. I do not see why an arahat should be hidden amongst the kāyasakkhi, ditthipatto, and saddhāvimutto—all these three have something further to do, as you may see from the Kītāgiri Sutta (M. 70), and this cannot be said of any arahat. I did not comment on this since I agreed that the reading 'arahī vā' (which is not in the P.T.S. 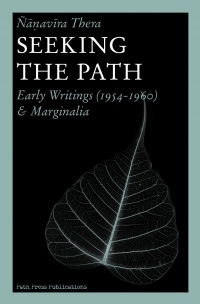 edition, even as a v.l.) was wrong. I still think it is. It may seem to you that the wind-element obeys me, but to me it appears otherwise. The wind element comes and lodges in my intestines for a large part of each day and causes a persistent discomfort that nearly prevents me from doing any ānāpānasati at all. 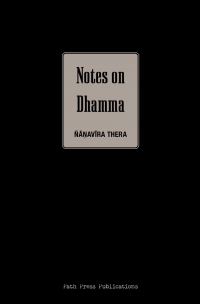 This has been going on for the last ten years, and at present seems to be getting worse (it is largely for this reason that I have spent so much time thinking about the Dhamma rather then practising jhāna, which was my prime reason for coming to Ceylon; but things having turned out in the way they have, I can have no reason for complaint). As a means of communication I prefer the post to the wind-element—though it is no doubt slower it is less liable to deliver a corrupt text. It may be that you have seen in me the arahat or that the wind-element has told you that I actually am arahat; but the plain fact is that I am not arahat and, partly on account of obstruction by the wind-element, I have no great hopes of becoming one in this lifetime. I am a long way from arahattā, I have far to go before reaching that. What exactly I am is a matter of no great importance, and for reasons of Vinaya, which have to be complied with, discussion of this matter is not advisable. It is obvious enough that you, with your present understanding, may arrive at certain general conclusions about what I am or am not; but that is neither here no there. In any case I must ask you, as far as possible, to keep these conclusions to yourself—it will be a considerable embarrassment to me to be talked about, and it will not serve any useful purpose. It may seem to you, perhaps, that I am being unnecessarily hard on you, especially at the present moment with your newly won dhammapīti. In my last letter I told you that I was delighted; and it remains true. I am delighted at your success—you have won a great victory over yourself, a victory that cannot be taken away. (I am a very cautious person, and I keep saying to myself 'I hope there is no mistake, I hope she really does see'. But from [? illeg.] your letter I think there is no mistake). But I must say also this: that if you want to make progress (and progress has to be made), you cannot afford to indulge in emotional states. I said that you are rapidly becoming a tower of strength; but it will not be 'rapidly' without a good deal of nekkhammasankappa. Do you not see the dukkha of emotions? Why torment yourself with myths of your own creation? Practise samatha, and let the myths die of neglect. 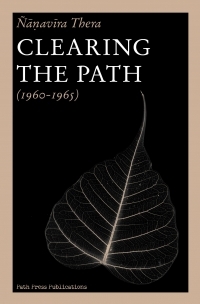 The letter, not included in Clearing the Path (1987, Path Press), was found later in Sri Lanka. Around in 1989 a letter has been received from a nun living in the south of Sri Lanka, a letter of Ven. 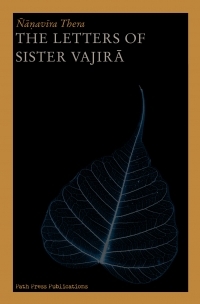 Ñānavīra to nun Vajirā, the existence of which was not previously known. Before his letter arrived, she had her 'mental breakdown' and was bustled out of Sri Lanka. Apparently, the letter had remained in Vajira's kuti for some 27 years untouched – except by insects and mold – until that nun found it. The original was sent to Island Hermitage to be added to the ' 'Ñānavīra Archives'.